CALIFORNIA NATIVE AMERICAN INDIAN body painting, historical face paint research, tattoos tatoos tattos, tribal war paint design patterns symbols and known cultural interpretations based on extensive research, interviews and field work documentary professional pictures, anthropology. Kumeyaay Indian face paintings and tribal design illustrations by researcher Paul D. Campbell (four of 120 similar illustrations included in Paul's book). KUMEYAAY.INFO is thrilled to feature the photographs, historical illustrations and writings of PAUL D. CAMPBELL, a highly-respected field researcher, writer and photographer who is well known among the top national and international museums of the California Indians for his deep research, why information and understanding about old and ancient Native American body painting, face paint, tribal designs and their meanings, including Indian cave art paintings, ancient rock painting pictographs, ancient aboriginal pigments used in North America, tribal body tattoos, aboriginal tatoo art ideas including the Yuman Indian North American tribes of Southern California, southwest Arizona, and northwestern Baja California, Mexico. 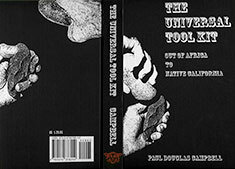 BUY PAUL D. CAMPBELL'S BOOK HERE "THE UNIVERSAL TOOL KIT Out of Africa to Native California"  In stock and ready to ship immediately (contact Kumeyaay webmaster for expedited and international shipping rates). Books ship free (USPS Media Rate) to 50 United States, contact Kumeyaay webmaster for expedited and international shipping rates. Sales tax California only, any sales tax paid outside of California will be refunded. Buy 1-3 books & SAVE! Product Dimensions: 9" x 6" x 1"
BUY PAUL D. CAMPBELL'S BOOK HERE "Earth Pigments and Paint of the California Indians Meaning and Technology"  In stock and ready to ship immediately (free economy shipping within the United States, contact Kumeyaay webmaster for expedited and international shipping rates). BUY 2-3 books & SAVE! The Yuman Indian face paintings pictured above are only four of 120 illustrated tribal face designs Paul Campbell has researched and included in his new book. 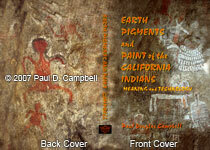 Paul's fully-researched book includes all facets of Native California pigments and paint, including physical, social, spiritual  in great detail  and reveals how the Indians turned yellow pigment red, how the Native Americans made blue paint from white gypsum and black charcoal, and the book will give many other ancient recipes for Indian paints. The pigment and paint book also discusses the origin of CAVE ART in California with many pictures of Native American cave paintings, and includes the latest atomic accelerator testing of the ancient pigments used by the California Indians. ANSWERS.GOOGLE researching professionals have published extensive links in response to CULTURAL WARRIOR MAKEUP WAR PAINT that is very interesting for serious research and includes Masai Warriors and Information, Samburu Warriors, El Molo Kenya, African Images, Surma Fighters, Canadian First Nations Face Paint images, Last Horse Sioux, Comanche, Iroquois, Seminole, Apache, Unkown, Shamans, Inuit Warriors, Cahokian, Acolopissa, Catawba, First Nation Histories, Geronimo, Chickasaw, including Latin America, Brasilian, Xingu, Kayapo, Amazon Shaman, Mexican Shaman, Maya Masks, Mexica Warrior, Video, Maps Culture of the Maya World, Aztec Warriors, Peruvian Inca Images, About the Moche, Peruvian Shaman, Yanomami Shawman, Yanoami Body Markings, MesoAmerican Cultures, Asian Warrior Images, Japanese, Chinese, Tao Warriors, Tatoos, Yali Warriors, Indonesia, Australia Warrior Info, New Zealand, Papua, New Guninea, Maori Pictures, Queens and Africa, Austrailian Aboriginal Information, Pacific Rim, Samoan Warrior, India, Indian Shamans  so please check the Google link out. BUY THIS BOOK NOW on amazon.com Photos and text courtesy of Paul D. Campbell, author of SURVIVAL SKILLS OF NATIVE CALIFORNIA. 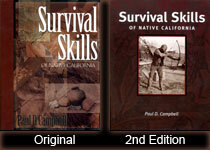 Paul's book features living (and now deceased) Native American California Indigenous people of the greater San Diego area, and details their traditional Indian hunting, primitive weapons and aboriginal survival techniques and aboriginal methods...Paul's book is available for sale at Shumup Ko Hup Indian store WEBSITE HOWKA.COM.